Safety has always been a huge issue in the trucking and automotive industries. Adding any kind of automation to the driving process only intensifies safety concerns. As a company, in everything we do, Peloton puts safety first. I realize that’s a common claim, but we actually live it. Here are a few ways we put our commitment to safety into action. We offer increased safety as a primary feature of our product. The Peloton system enhances driver safety by reacting more quickly, more accurately, and more reliably than drivers performing manual driving. Our vehicle-to-vehicle (V2V) communication technology is key to Peloton’s overall safety claims. We apply state-of-the-art standards from the automotive industry. In the absence of standards aimed specifically at commercial trucking vehicles, we start with the next closest thing: ISO 26262 Road Vehicle – Functional Safety, the current state of the art for safety in the automotive industry. Think of the standard as having a “V” process for developing automotive electronics in a safe manner. The “left leg” of the V describes what design parameters the system, hardware, and software are required to meet, while the “right leg” of the V generates test artifacts at the software, hardware, and system levels. By completing both legs of the ISO V process, Peloton can feel confident that we are developing our products in a functionally safe manner. We use our Network Operations Cloud (NOC) and other technologies to supplement safety considerations. Peloton’s cloud-based NOC uses technologies such as GPS and geofencing to provide data about truck locations and operations. In addition to arming each driver with the best and most up-to-date information affecting driving and safety, the NOC can prevent engagement of a platoon if it detects issues such as truck speeds that are too slow or too fast; unsafe road or weather conditions; or trucks leaving a platooning-approved divided multilane highway. We can also use our NOC to provide drivers with advanced warning about potential safety hazards. Peloton can send over-the-horizon alerts to both individual and platooning drivers, alerting them to upcoming safety conditions such as accidents, traffic, construction, or changing weather. We take a data-driven approach to safety design. We model design systems to absorb real-world variables that might affect stopping distance—everything from road and weather conditions to the age and tread depth of tires, brake pad condition, and whether trailers have disc or drum brakes. Then, we apply external mitigations that are outside the design parameters for an extra margin of error for safety. We also use sophisticated data management to model datasets for the new technology of platooning, using government-collected collision data. We test and test and test some more. Peloton releases nothing on the road (even for internal use) until we verify through rigorous testing that our systems are implementing their design correctly. That means we do a lot of track testing. We also maintain clear traceability from our concept and operating design to our hazard design, requirements, and test cases. We provide specifications and set parameters for proper and safe use of the Peloton platooning system. Just like a new piece of software has a set of system requirements that determine its proper operation, Peloton provides specifications for the proper and safe use of our platooning system. These include tire, brake, and other mechanical specifications of the trucks themselves, as well as prohibitions from platooning in residential areas or on highways with either too many or the wrong kinds of onramps for safe merging of traffic. We work closely with partners in the trucking industry. An example is Bendix, one of the main suppliers of braking systems to the trucking industry. Peloton works with Bendix on every step of our platooning process to make sure that our safety strategies are aligned. And our partners need to sign off from a safety perspective before Peloton can launch our products. 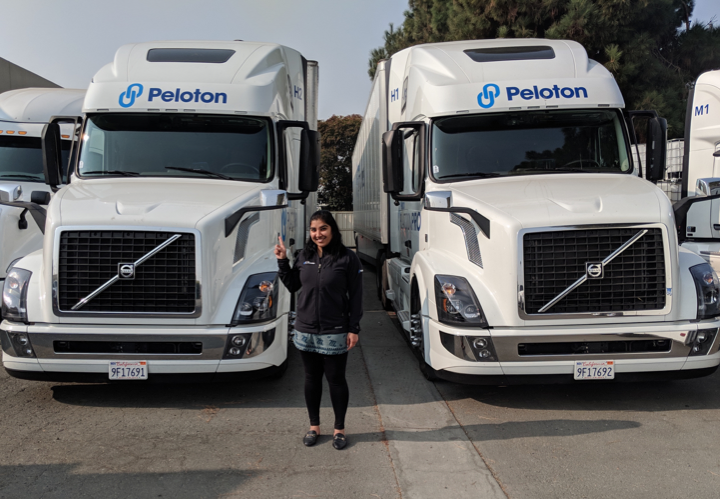 As a leader in platooning technology for the trucking industry, Peloton is working ahead of both government and industry regulatory bodies. To a large extent, we must police ourselves, which is challenging. Peloton has chosen to rise to this challenge by going above and beyond whatever standards we can extrapolate from related industries.